Wow .. I am extremely happy to be writing my 100th post and I thank all of my friends without whose support I would not have come thus far. The journey although tedious at times has been by far the most pleasurable one. I have to specially thank K who has been helping me in the technical aspects of the blog and also guiding me as I take baby steps in photography. With just 3 ingredients mysore pak is sure to work wonders on the palate. How can I describe this sweet .. hmm .. can we say “Sinful Delight”? There are two types, one is the hard crumbly one and the other is the soft one. Shree Krishna Sweets is pretty famous for the soft mysore pak. It just melts in the mouth leaving the taste of ghee lingering and then we crave for more !!. K loves this sweet and my mom makes it a point to pack some from Shree Krishna Sweets if anybody is travelling to US. I normally shun away from recipes with butter and ghee, but I wanted to make the 100th post special and the added bonus is that it is K’s favorite. At least I can say that I am hogging the computer for a reason .. I am making stuff which you like !! Added to that another reason for which I would make this sweet again is that my 3 yr old loves it. She could not remember the full name and she calls it “Soo-pa”. How cute is that? When I left the sweet in the plate for it to cool, she was happily helping herself now and then until I moved it to a different place. She was so mad and came to me angrily and said: “Amma, you have to make lots of this sweet”. Thanks to K for capturing the process as I kept stirring. I have added my experiences in the Notes section. 1. Sugar syrup consistency is important as we might end up with a crumbly mysore pak or a hard one if consistency is not right. 2. Heat should be on low or medium low. 3. Continuous stirring is required. 4. Fresh ingredients yield good results. 5. This method yields very soft melt-in-the-mouth mysore pak. Roasting the flour also yielded soft mysore pak, but the sweet crumbled in the mouth and K liked that version better. I liked it both ways. Sift the bengal gram flour. Add 3oz of ghee to it. Add the remaining 3oz of ghee and let it rest for say 15 minutes. Grease a plate to pour the mysore pak when done. You will NOT have time to do later as everything happens very fast. Mix the besan-ghee mixture well to a pouring consistency. Watch for one-string consistency. You can check this easily by placing a drop of sugar syrup mixture in a bowl of water. If it does not disintegrate and forms a ball then you can roll a drop in between your thumb and index finger. It will form a string. Add the besan-ghee mix to the sugar syrup slowly and stirring continuously. From now it is all about stirring. It is good to have a helping hand to take turns stirring . Scrape the edges of the pan and keep stirring. Keeping the heat on low to medium-low is very important. Keep stirring adding ghee in intervals so it does not dry out. Can you see the mix getting less sticky and easy to stir? Keep stirring and adding ghee until it balls up. See how it is all coming together. We are not quite there yet .. less than a minute to go. Just to show more clearly .. see how the mixture is leaving a trail when stirred. It is ready. Look at that ball and notice the mixture is not sticky anymore. Pour into a greased plate and let it spread on its own. Shake the plate for it to spread. Let it cool for say 7-8 minutes and then slice. I used a pizza cutter. 10-15 minutes later you can remove the pieces. My 3 year old could not keep her hands off the sweet and she even sneaked her tiny index finger on the sweet. I managed to click the final product when I roasted the flour. Other steps remain the same. You just roast the sifted flour for a couple of minutes before adding the ghee to make a dough. Can you see the texture and it spread on its own giving that beautiful top layer. Phew !! .. Finally we get to eat. It took about 7-8 minutes after the besan was added to the sugar syrup. (The total cooking took about 20 minutes). 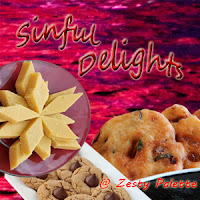 Linking to Sinful Delights happening here, DIO – Sugar & Butter hosted by Sowmya. It is a locknlock brand skillet bought online. It is the same as this one. Thank You very much for the recipe and clear instructions.Tried it out just now and I am very happy with the result especially this being my first attempt. Thanks a lot once again. superb recipe……i tried dis 2day and awesome was the result…..
congrats for the 100th postmysore pak looks superb, irresistable one…. gonna try for 2day. congrats on your first century…Mysore pak looks so delicious n yummy..this looks like famous Krishna sweets-Mysore Pak…so tempting going to try this soon…thanx for the step wise pictures..
வாழ்த்துக்கள் வர்தினி! கிருஷ்ணா ஸ்வீட்ஸ் மைசூர்பா போலவே இருக்கு! Congratulations on making your first century!! What a great dish to blog for it too it looks marvelous — great display! Congrats on the 100th post!! Mysore Pak looks soo delicious!! perfect way to celebrate the milestone!! Congratulations on your 100th post Vardhini. My dad loves this mysore pak but i have never tried making it at home till now. Maybe i should make this for his retirement day next month. Good luck with the next few hundred blogs. Congrats Vardhini., That's big milestone to achieve and I can't think of a better way to celebrate it. Congrats on ur milestone…Awesome sweet to celebrate with…looks super delicious…bookmarking this..
Congratulations on reaching your 100 posts milestone. Mysorepak looks amazing, awesome pictures. Congrats on reaching 100 pasts, with all the hard work and yummy cooking! Cheers! வாழ்த்துகள் வர்தினி…இன்னும் பல குறிப்புகள் தர வாழ்த்துகள்..
Congrats on your 100th post. You have a wonderful blog. Also the Mysore pak looks simply delicious. Thanks for sharing the step by step method of the preparation. Congrats Vardhini ~ a great milestone n cheers to many more such beautiful milestones to come! Congrats on the milestone!! An achievement indeed..
Congrats on this milestone dear! !Mysore pak looks so delicious and yummy. Congrats on this milestone!!! Ofcourse, such an occassion is special & is the time to indulge!!! Pak looks too yummy!!! Congrats n this is such a treat i hesitate so much do prepare dishes with ghee but am gone never seen so yummy mysurpa love it.. and i shd try it def ..
Congratulations on the 100th post dear! WIsh u many more! Mysore pak looks super soft and out of this world!! Congrats on the milestone and what a fitting recipe to celebrate….Loved the last pic which shows the texture beautifully. One word Vardhini – AWESOME !! excellent texture, yes – one step wrong and its a completely different texture .. ur step by step click is perfect ! Congrats on the milestone and wishing you many more such sweet memories And thanks for linking it to the event too ! Congrats on ur 100th post!! mysore pak is so tempting and love it !! perfectly done !! Congratulations on reaching your 100th post!! That's an awesome sweet to celebrate it with…so tempting…mouth watering!! Hey vardhini….Congrats on your 100th post…Hope to see many more….Mysore pak looks delicious…Thnx for joining my blog…I'll surely participate in the event…. What a way to celebrate ur milestone……Yummilicious Mysore Pa…Just like the famous Krishna sweets of Coimbatore!! Just melts in ur mouth!! Congrats on your milestone…..the last pic is tempting me….and I am going to TRY!!! Congrats on your 100th post, mysore pak looks awesome. congrats vardhini..thxs for this yummy sweet..
Congrats on reaching the milestone!! And the superb recipe is worth all the effort!! Congrats on your 100th post….Wow! this looks absolutely delicious. Congrats on your 100th post! that is a great milestone!! And mysorepa is a perfect way to celebrate..
now I realize I important and fun that would have been…. Congrats on ur 100th post.. I love mysorepa.. Nice and clear step by step pics..